This group of structures, situated on a tiny isle, is in imitation of the Jinshan temple of Zhenjiang, Jiangsu Province. The front gate of the main hall faces west and sits opposite the Ruyi Sandbar across the river. A horizontal board inscribed with the name of the buildings in the handwritl i of Emperor Qianlong is hung above the front gate. The western shore of the lake is lined with a long corridor. 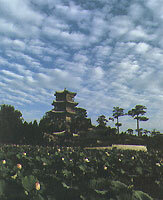 The eastern side of the isle looks like a dune, on which stands the Tower of Heavenly Emperors, a hexagonal structure in three floors. A statue of the God of Northern Lunar Mansions is enshrined on the second floor, and that of the Jade Emperor sits on the third floor. Both floors are decorated with horizontal boards inscribed by Emperor Kangxi. Observed from the Ruyi Sandbar in the east, this group of buildings look as if they were protruding from the water. From the Tower of Heavenly Emperors one can feast his eyes on the landscape.